Alright! Well it is not Wednesday, but it has been two Wednesdays with no page, so I decided late Sunday/early Monday was good. Why not? This is all we have done at the moment. I have been struggling to keep drawing pages with my work load lately. But I am very thankful for those who have pledged at Patreon to chip in some money whenever I post a page. I just reached my $150/page milestone. So now anyone who pledges $1 or more not only get digital copies of my two sketch book collections and my first graphic novel, the Weevil. 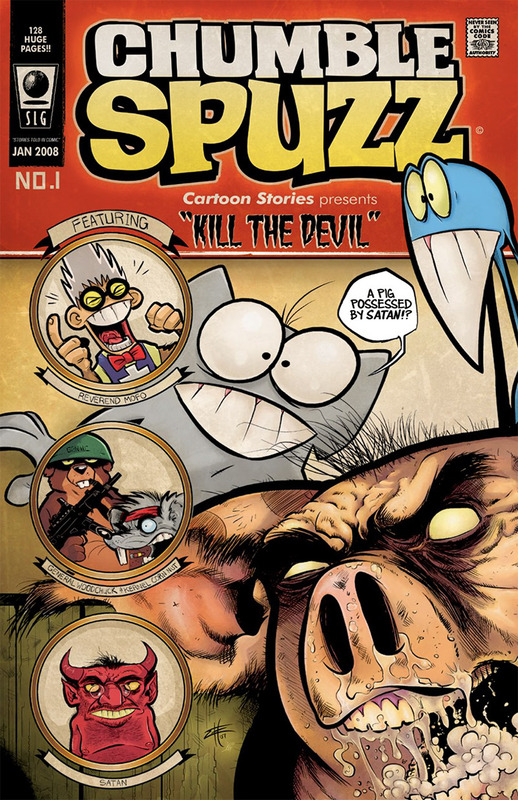 You also now will get volume 1 of Chumble Spuzz! Seriously, right now if you go pledge a dollar you get all that material. Years of my life, slaving and drawing. One dollar! Go now! As soon as I can I will get the next page done. I apologize for the delays and the sporadic schedule! Is my phone haing issues again, or is there no comic page visible right now? not sure what happened but I was tired enough last night not to notice there was no page posted. It’s up now! Honest question here: how do you decide which words to emphasize in the speech bubbles? Just sort of say it to myself and put emphasis on the ones that seem like they need it. Just feels stale to me for the words to not have emphasis added anywhere. i understand what ya mean. sometimes when im typing things out, i’ll capitalize a word that normally shouldnt be, because i feel it needs to be emphasized because of how im talking. Man, I wish I had a buck to spare right now. I feel like you are significantly overusing bold text for emphasis. There’s so much of it that it honestly breaks my ability to focus on the plot as opposed to the “meta” stuff. I like the old Atop The Fourth Wall exercise of SHOUTING all the bold, italicized words to hear how unnatural they sound. I enjoy the bold emphasis. It adds character to the dialogue, and provides a sense of urgency during the action scenes. Keeps the conversation from just being a monotone series of word bubbles. Also provides a sense of what’s important to the author. It’s not 100% natural emphasis, but I don’t think that’s the goal here. whens a bear gona get suplexed? i came to see that. When they find a gorilla. So, it the comic on indefinite hiatus again? It’s beginning to feel like this comic isn’t a priority for the creators at all any more. I believe you are correct, medaron! Also, you may have gotten the sense that he loves this project and is passionate about seeing it completed. Good evidence for this is that he worked on it for a long time without seeing a dime from it. Cheers Ethan! We love you. Agreed! It always disappoints me how grumbly people get on the internet when they feel entitled to something that they don’t pay a dime for, and that the creator provides to the public at their own expense. Why can’t we all just be supportive, recognize that Bearmageddon is just one of MANY projects that Ethan has going at the moment, and that he needs to prioritize things based on what will place food on the table for his family? Come on, folks! Enjoy what’s been given to you, and if you REALLY want to encourage more Bearmageddon, join the Patreon to make it financially feasible for Ethan to focus back on this comic! <3 y'all. I’ve been waiting 3 years to see people get killed by monster bears. I haven’t seen it. I’m done. Good luck. I think you missed the pages where this happened. Actually quite a few people were killed by bears already. Just because it hasn’t happened in a while doesn’t mean you should give up on it. Ethan has a family and a job to worry about, and all we can do is support him and hope he happens to find some extra time. Well, good, then. Ethan doesn’t need readers who are going to begrudge him needing to take care of Real Life before having fun with little side projects. Well then let’s just say it. 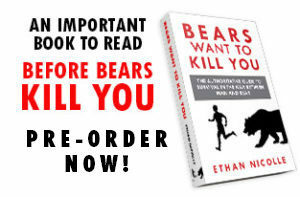 I would pay to see bears kill people. Let’s do that. I guess I’ll read Adventures In Jetpacks, oh wait… That’s an awful idea. This has gone from sad to pathetic. 19 pages this year, so far.